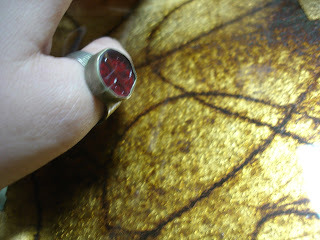 This Ring contains a Marid prince who will lead their master toward outstanding noble qualities, *Courage and Valour*! These attributes are of the highest merit in the Djinn kingdoms, no evil or malicious Djinn will come close to the Aura of a djinn that possess these virtues, and in the Astral realms everything is organized in structured everything runs in terms of merit and aquired knowledge and wisdom. This prince is one of noble class and his lineage is royalty he is at least 2000 years old which qualifies him as a wise and knowledgeable djinn in his class. He will grant you wishes and whisper guided messages in your ear when you need inspiration and a guiding voice, he will strenghten you back so to speak and give you the confidence needed to accomplish difficult tasks, making them easy much like a fresh breeze thats sweeps away hardship from arduous conditions and circumstances. He will better and improve your life! Allow this djinn to sweep away the burdons of strife for you and tell him your problems he will find the solutions and change the energies to offer you an easier life and a higher potential of living and being. He is of royal class that is provided to humanity to help its evolution in this era. If you open your heart to this prince and you will never be disappointed. This ring is over 200 years and the conjuring took place during this time also, it is made of silver and has traces of some other blended metals, there are engravings in the ancient stone that are secret symbols, they are magickal symbols that elevate the vessel and render it more powerful, you don;t have to charge it, it does that itself, beautiful piece!